Get a FREE Honda Plus Extended Warranty* with the purchase of your new 2018 Honda Accord! Once you’re in the brand new 2018 Honda Accord, you’ll never want to get out. Boasting intuitive technology, heated front seats & luxurious accents, the all-new Accord surrounds you with an abundance of style, comfort & functionality. Join other happy Honda customers at Pickering Honda to test drive the Accord today! Don’t miss this amazing deal on the Honda Accord – your offer only lasts until May 31st. 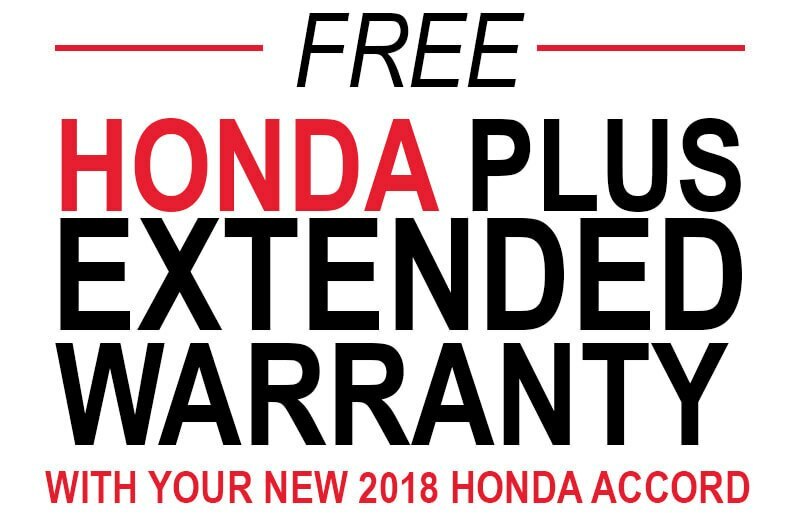 Receive a Free Honda Plus Extended Warranty for the monthly term of your new lease or finance contract of a new 2018 Honda Accord. Must finance or lease new Accord through Honda Financial Services to receive incentive. Offer applicable to those who currently own a 2013-2017 Honda Accord. Must show ownership of currently Honda Accord to receive discount. Current vehicle must be registered in your legal name to receive discount. Restrictions apply. See Pickering Honda for details.